Reported variants represent identical protein: NP_036421.2 and NP_987096.1. Synthetic peptide with a Cysteine residue linker, corresponding to N terminal amino acids 41-53 of Human Keap1 (NP_036421.2). 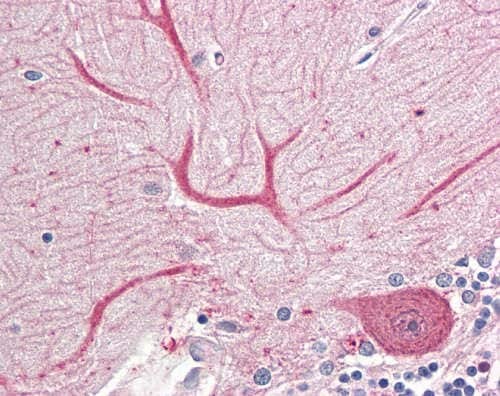 NIH 3T3 lysate; Human Brain, cerebellum tissue. Our Abpromise guarantee covers the use of ab166721 in the following tested applications. WB Use a concentration of 0.2 - 0.6 µg/ml. Predicted molecular weight: 70 kDa. Retains NFE2L2/NRF2 in the cytosol. Functions as substrate adapter protein for the E3 ubiquitin ligase complex formed by CUL3 and RBX1. Targets NFE2L2/NRF2 for ubiquitination and degradation by the proteasome, thus resulting in the suppression of its transcriptional activity and the repression of antioxidant response element-mediated detoxifying enzyme gene expression. May also retain BPTF in the cytosol. Targets PGAM5 for ubiquitination and degradation by the proteasome. The Kelch repeats mediate interaction with NF2L2/NRF2, BPTF and PGAM5. Ubiquitinated and subject to proteasomal degradation. Immunohistochemical analysis of Formalin-Fixed, Paraffin-Embedded Human Brain Cerebellum tissue labeling Keap1 with ab166721 at 3.75 µg/ml. ab166721 has not yet been referenced specifically in any publications. Publishing research using ab166721? Please let us know so that we can cite the reference in this datasheet. There are currently no Customer reviews or Questions for ab166721.